Like I reported a few days ago, Mercedes invited some bloggers from all over the world to a Brand Workshop in Stuttgart. And this is the report of two amazing days we spend with interesting insights, inspiration and an ongoing exchange. Maybe you ask yourself, why did they do it? 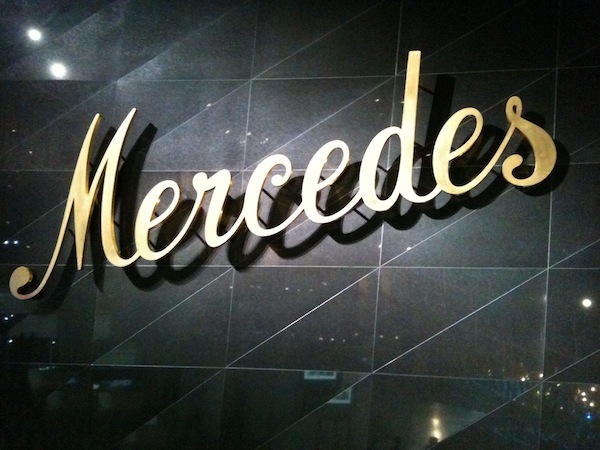 Why did Mercedes invite blogs to take a closer look at their brand? And the answer is pretty easy. They wanted an exchange of knowledge, passion and inspiration. They invited us to get to know this web thing. For expample the team of Kristina Mainka und Tobias Müller asked me why I am contributing to this whole social internet stuff. And in return they told us about the tradition and image of Mercedes-Benz. So, I took the flight with Marcel from Hamburg to Stuttgart on wendesday morning. We arrived in Stuttgart and a shuttle brought us to the hotel. Le Meridian was stunning, but I didn’t spent a lot of time in my hotel room. Marcel and me spent three hours of freetime in the Schlosspark, sitting in the sun, laughing at Stuttgarter musicians and ice bears. Later Jakob, Philipp, Christian and Marcel joined us. In the afternoon we all met at the hotel lobby. And finally we met a lot of interesting people from Seattle, L.A., New York, Zurich, Romania, Berlin… It was great to see who else was invited. 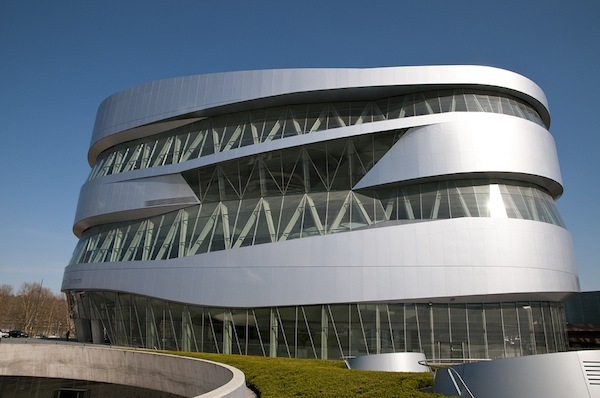 We all took shuttles to the Mercedes-Benz Museum (picture above is from Philipp Thom). The building itself is worth a trip. It is a stunning piece of architecture by Ben van Berkel and the UNStudio. You can take a look at some great pictures of Jean and details at NOTCOT. On the top floor we were welcomed and were introduced to the brand Mercedes-Benz with a little talk about the history. It was very interesting to see and hear where it all started. Then we made a guided tour through the museum and saw the history of Mercedes for ourselfs. There were some crazy cars. 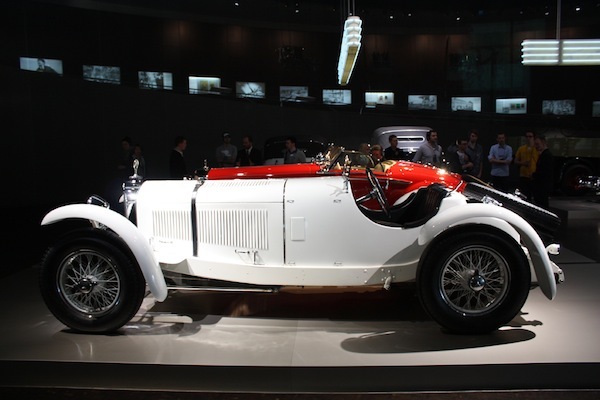 I espacially fell in love with the Adenauer Mercedes (not the one above, sadly I don’t have a picture of it). One amazing feature of the museum is that you can follow the path through the museum like in the Guggenheim in New York. You just go one way which leads you through the whole musuem and sometimes there are special areas where you can “get off the road”. It is structured like a double helix. Great for getting lost in the actual exhibition pieces and not getting disturbed by finding the right way. After the tour, we went up to the top again to have a nice dinner and interesting conversations with different people. After a few glasses of wine we went back to the hotel. Where Mercedes aksed us to join for a couple of drinks. And the great conversations were continued. The next day started with a trip to the Mercedes Design centre in Sindelfingen. Where we were welcomed by Steffen Köhl, Head of Advanced Design. He had an incredibly inspiring talk about the design department of Mercedes Benz. It was very interesting to see how Mercedes is working and how long it takes to create a car. One thing which totally got me was that they are looking for designers who still know how to work with their hands. Creating, playing, trying out new stuff. And that they were less interested in people who can just use photoshop. Playing with design has a big status at the design depatment of Mercedes, and that was very interesting to hear from an accurate and technical field like car design. Of course one of the highlight was the Powerwall. 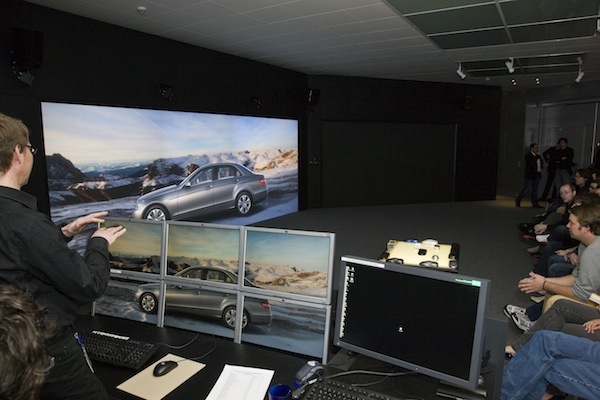 Two giant surfaces for two times 6 HD-Beamers which can be controlled by an interface table. Be sure to get more informationa and visual impressions at Jean’s report. The tour went on with an insight into the department of colors and trim. They showed us where there are looking for inspiration, and a big source of inspiration is the fashion industry: colors, stitches, materials and shapes. After that we went to the hall, where the newest cars were presented and some concept cars. After a delicious lunch at the test drive area in Malmsheim we were finally allowed to get our hands on some cars. For example I drove a new convertible (I must admit I can’t remeber if it was a CLK or CL or E-class?). But anyways my mind was blown by the car ride in one of the most expensive cars of the world, the Maybach. And by far the most comfortable car ever. Of course Marcel and me listened to some matching music, Vivaldi. And it is a stunning piece of design and luxury. So many freaky details. Und ganz nebenbei haben die Mercedes-Leute ‘ne massive Viralmarketing-Kampagne losgetreten, oder? Clever! Naja, viral ja nicht. Sie sind ja offen damit umgegangen. Und wir konnten ja frei entscheiden, wie wir darüber berichten und ob überhaupt. Aber ich denke, das war echt der richtige Schritt. Wir haben schon gemerkt, dass sie auch etwas von uns wollten, aber es hatte eher was mit Erfahrung und Wissen zu tun. Sie wissen ja auch, dass meine Leser jetzt nicht losspringen und sich einen Benz kaufen (oder ein Maybach) aber sie wollten ja was bieten dafür, dass sie Wissen und Aufmerksamkeit von uns bekommen! Why I liked the last two days.. | better taste than sorry. SMART – brand workshop | better taste than sorry.